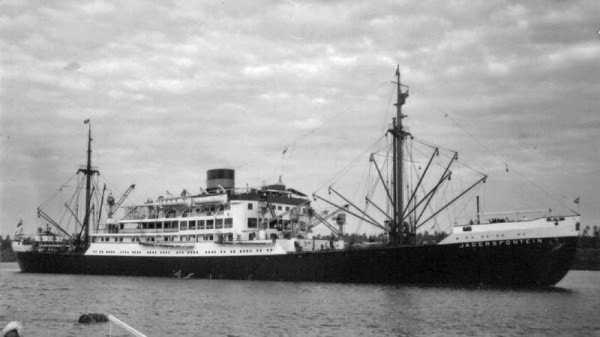 S.S. Jagersfontein built in 1934 – note the many cargo derricks, the passenger accommodation and portholes admidships, and the crew portholes at the bow or forecastle. The diesel motor vessel Jagersfontein was built by the Netherlands Shipbuilding, or Nederlandsche Scheepsbouw Mij. N. V., in Amsterdam in December, 1934. The vessel was yard number 229, and her call sign was PEYW. She was designed to carry both cargo and passengers. The ship’s dimensions were 10,083 gross registered tons, 489 feet long, 63.1 feet wide and 34.1 feet deep. With a hull built of steer, her double six-cylinder Stork diesel engines developed 2,334 net horsepower and propelled the ship at an impressive 16 knots. The Jagersfontein was sent from South Africa, where it was serving the Holland-Africa Line, and was due to sail from Singapore on December 16, 1939. On November 28, 1939 the “Oakland Tribune,” of California added that the Jagersfontein was due to depart from the Golden Gate (San Francisco Bay) on February 3rd. According to the “Port Director’s Report” for Honolulu Hawaii, by an amazing coincidence the Jagersfontein arrived in that port at 09:30 am on the 7th of December, 1941 – right in the middle of the attack on Pearl Harbor nearby…. During World War II the Dutch flagged Jagersfontein was armed with a 105 milimeter gun mounted on the stern. The ship’s owners were Vereenigde Nederlandsche Scheepvaart Mij. (VNS), based in the Hague Netherlands. On her final voyage there were 220 people under the command of Captain Machiel A. van der Est. There were 14 men to man the gun, 108 crew, and 98 passengers, amongst them women and children. Of the 98 passengers there were 86 United States Army officer as well as a dozen civilians. Among 9,000 tons of general cargo the vessel carried resins, copper, cotton, timber and lead. On Thursday 18th June 1942 left Galveston, Texas bound across the Atlantic to Liverpool, England. The ship headed across the Gulf of Mexico, around the southern tip of Florida. After passing through the Bahamas she sailed independently to pass south and east of Bermuda. By Thursday the 25th the ship was 500 nautical miles east-northeast of Bermuda and 900 nautical miles south-southeast from St. John’s, Newfoundland. At 3:13 am on the 26th local time Gelhaus fired two torpedoes from tubes one and two from 1,500 meters. It took the missiles four and a half minutes to strike the ship forward of the after mast and behind the main superstructure. Though the Jagersfontein started settling by the stern she maintained headway at between 13 and 14 knots. Gelhaus decided he would attack from ahead. As dawn spread across the sky however the passenger ship maneuvered closer to its attacker until at 4:00 am it fired on the sub with its stern cannon. This caused Gelhaus to sound the alarm and dive. “…four lifeboats and a raft float about. The lifeboats are heavily occupied also a number of women. Approached close to the lifeboats. Ran off. Lifeboat 3 is equipped with a radio and transmits SOS. According to the Radio Message there are 220 men in the boats. SOS was heard by a Swiss and even by 2 Portuguese. The Swiss takes them aboard during the night.” U-107 went on to rendezvous with the “Milchkuh” or milk cow U-tanker U-459 under the command of Georg von Wilamowitz-Möllendorff. 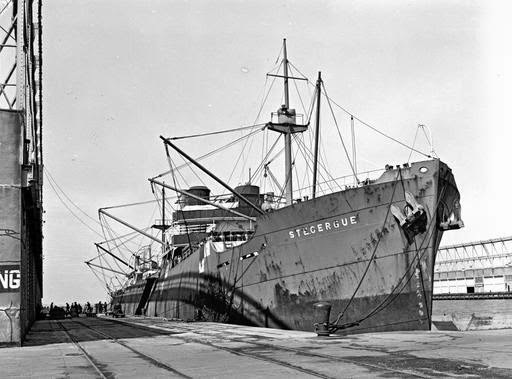 The Swiss steam ship St. Cergue at Norfolk International Terminals in March 1940. The St. Cergue was registered to Basel (after being flagged to Panama earlier in the war). It was one of several Swiss ships which had a Swiss national as a captain: Captain “Fritz’ Gerber began his career in 1898, at the age of eighteen, on a sailboat assigned to Bremen. The captain continued on German ships, sent to Siberia and the Far East. At the beginning of World War II, Gerber was first appointed captain ST. CERGUE, and then led the team on the other Swiss ships.” Gerber was skipper of the St. Cergue at the time of her rescue of the Jagersfontein survivors. In early June 1941 Dutch resistance fighter Peter Tazelaar “mustered as a stoker on the Panamanian-flagged, Swiss freighter St-Cergue. The ship was in the port of Schiedam and was voyaging to New York to pick up a supply of corn for the Germans.” The ship, formerly known as the British Felldene until 1939, was 4,332 gross tons and flagged to Panama then Basel. She arrived in New York on the 29th of March 1940, and in 1941 sailed from that port on the 13th of August, the 8th of October, and the 6thof December. In 1942 she sailed from New York on the 19th of February, the 25th of April and the 20th of June – right before her voyage to Galveston. The following is an entry about the St. Cergue’s war career and rescue of the Jagersfontein from a site dedicated to merchant marine ships of Switzerland: “The first voyage under Swiss flag was with a full load of grain for Switzerland from New York to Genoa, Italy, returning back to the USA with Swiss machines and other quality products. Note during the entire war the Swiss ships were working under orders from the KTA, Bern. At 9:38 am on Saturday June 27ththe US Navy destroyer USS Bernadou (DD-153) came upon the St. Cergue on the open ocean. Launched on 7 November 1918 at the William Cramp and Sons yard in Philadelphia the ship was commissioned into the navy on 19 May, 1919. Displacing 1,154 tons the ship was 314.5 feet long, 31.8 feet wide and 9 feet deep. Capable of 35 knots she was manned by 122 officers and enlisted men. By June 1942 the destroyer was assigned to a route between Iceland and Newfoundland. It so happens that the Bernadou was in Bermuda, training in conjunction with submarines R-1, at the time. At 12:47 pm on Friday, June 26th it broke off exercises to head on course 93 degrees east at 23 knots in order to rescue survivors of the Jagersfontein. He commander since October 1941 was Robert Edgar Braddy, Jr., US Navy. USS Bernadou in wartime dazzle coloration. According to Admiralty sources (War Diary for Foreign Stations Weds. 1 July 1942) there were five DEMS or Defensively Armed Merchant Ships ratings, six British AA (Anti-Aircraft) gunners and two Dutch Army “other ranks”. From a comprehensive list tallied by Tim Coone from the Bernadou’s log, the total number rescued was 98, of whom 85 were US Army officers, including members of the Medical Corps (the British over-counted the US survivors by one). 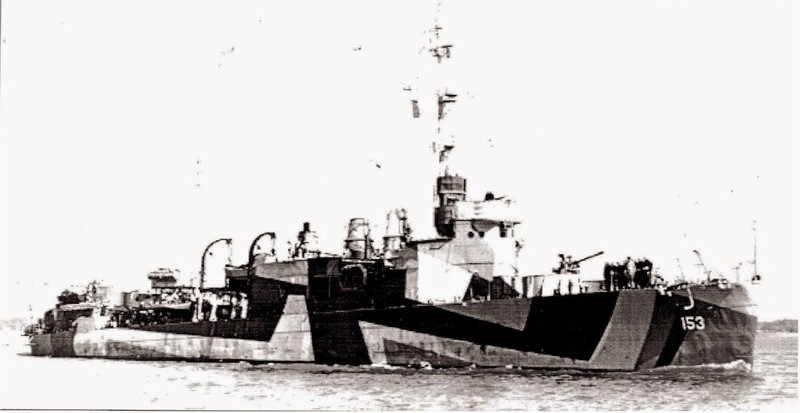 At 12:44 the destroyer set a course for Bermuda and ramped up speed to 20 knots. USS Bernadou anchored in Port Royal Bay, Bermuda at 4:03 pm on Sunday, June 28th 1942 after steaming 493 nautical miles since noon the previous day. Her speed was 22 knots. The sea was calm and wind very light. Her men first sighted Bermuda at noon, sighting Mount Hill [Gibbs Hill] Lighthouse ten miles out at 12:26 pm. The same report went on to say that “Rescued crew 100 including 2 women and also 12 passengers continuing voyage in ST. CERGUE.” Clearly this intelligence is based on interviewing survivors in Bermuda and can be deemed accurate. At 1:15 pm Lieutenant Colonel Hastings from the US Army “came on board to interview survivors,” according to the USS Bernadou war diary. At 2:20 pm the destroyer entered Two Rocks Passage Channel. At 2:37 pm she moored at Shed Six Dock in Hamilton. Thirteen minutes later, at 2:50 pm Hastings led the survivors of the Jagersfontein off of the vessel. At 3:16 the Bernadou left Hamilton, passed Pearl Island Light abeam to port and anchored in Port Royal Bay. The reason that the landing of so many survivors did not make it into the local Bermudian press must be their military status: the government officials were no doubt reluctant to publicize the movements of military personnel. They would have been put up in military accommodation rather than relying on locals or local charities. 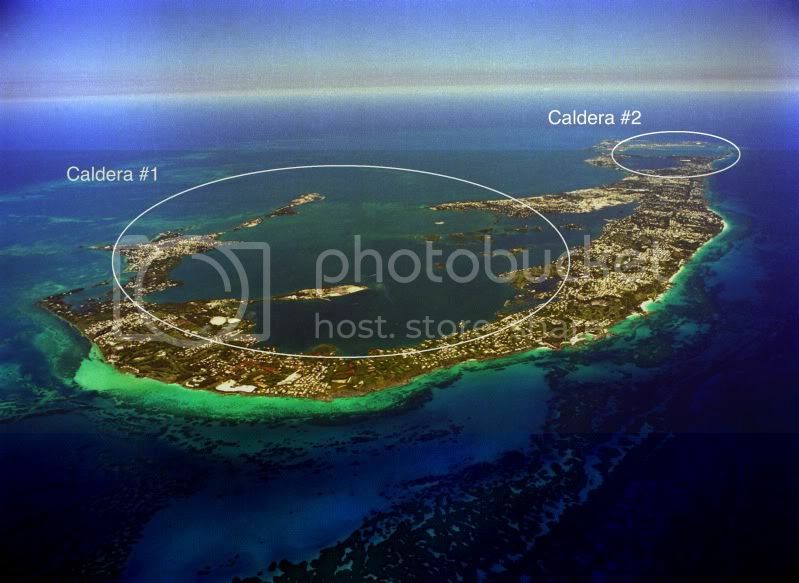 Aerial photo of Bermuda from the southwest. Two Rock Passage to Hamilton is inside the large circle to the upper right, Pearl Rock Light is near the center of the image, and Port Royal Bay anchorage is in the foreground, also inside the larger circle. The USS Bernadou was decommissioned from the US Navy on 17 July 1945 and sold that November.